Of jarring seeds; and justly Chaos nam’d. As translated by John Dryden, et al. and Sir Samuel Garth (ed. ), Metamorphoses (1998), 3. Ovid started writing the 14 books of Metamorphoses in about 1 a.d.. Dryden died in 1700. He had translated about one-third of the full Metamorphoses. His work was finished by others, and the translation was published in 1717. 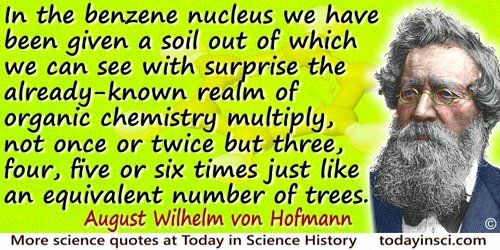 In the benzene nucleus we have been given a soil out of which we can see with surprise the already-known realm of organic chemistry multiply, not once or twice but three, four, five or six times just like an equivalent number of trees. What an amount of work had suddenly become necessary, and how quickly were busy hands found to carry it out! First the eye moves up the six stems opening out from the tremendous benzene trunk. But already the branches of the neighbouring stems have become intertwined, and a canopy of leaves has developed which becomes more spacious as the giant soars upwards into the air. The top of the tree rises into the clouds where the eye cannot yet follow it. And to what an extent is this wonderful benzene tree thronged with blossoms! Everywhere in the sea of leaves one can spy the slender hydroxyl bud: hardly rarer is the forked blossom [Gabelblüte] which we call the amine group, the most frequent is the beautiful cross-shaped blossom we call the methyl group. And inside this embellishment of blossoms, what a richness of fruit, some of them shining in a wonderful blaze of color, others giving off an overwhelming fragrance. A. W. Hofmann, after-dinner speech at Kekulé Benzolfest (Mar 1890). Trans. 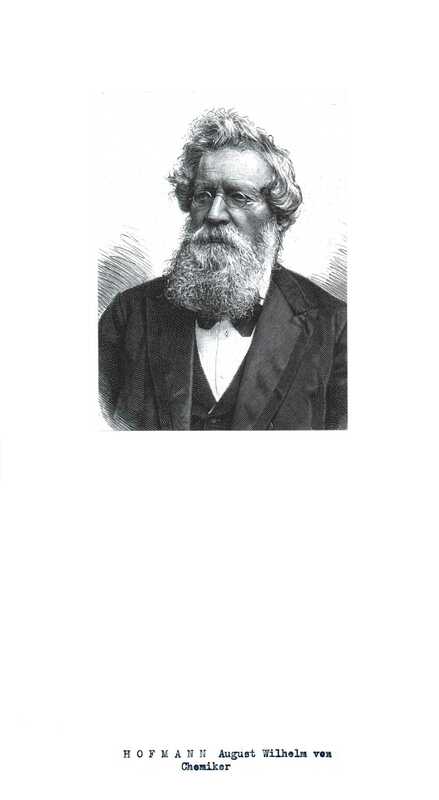 in W. H. Brock, O. Theodor Benfrey and Susanne Stark, 'Hofmann's Benzene Tree at the Kekulé Festivities', Journal of Chemical Education (1991), 68, 887-8. It is hard to imagine while strenuously walking in the heart of an equatorial rain forest, gasping for every breath in a stifling humid sauna, how people could have ever adapted to life under these conditions. It is not just the oppressive climate - the tall forest itself is dark, little light reaching the floor from the canopy, and you do not see any animals. It is a complete contrast to the herbivore-rich dry savannahs of tropical Africa. Yet there are many animals here, evident by the loud, continual noise of large cryptic insects and the constant threat of stepping on a deadly king cobra. This was my first impression of the rain forest in Borneo. Now when you cut a forest, an ancient forest in particular, you are not just removing a lot of big trees and a few birds fluttering around in the canopy. You are drastically imperiling a vast array of species within a few square miles of you. The number of these species may go to tens of thousands. ... Many of them are still unknown to science, and science has not yet discovered the key role undoubtedly played in the maintenance of that ecosystem, as in the case of fungi, microorganisms, and many of the insects. On Human Nature (2000). In John H. Morgan, Naturally Good (2005), 252.